What do you mean by Combination? How the different groups can be formed using Combination? How the alike objects can be distributed? Is there any relation between Permutation and Combination? These two words permutation and combination, at the initial level are very confusing and are generally used interchangeably. So, let’s take them one by one and understand them. Combination means from the given certain objects (may be alike or different) selecting one or more objects. 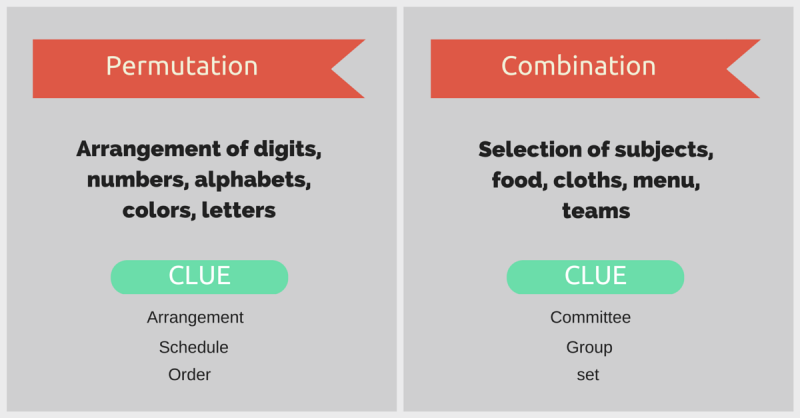 Combination can also be replaced by the words – selection, collection or committee. Combination of top 5 cricket players from the team of 11 players is the selection of 5 players (in any order). Combination is the selection or collection of one or more things from the given list of alike or distinct objects taken all or some at a time. Here, in the definition of combination, r can be any positive integer less then or equals to n.
Let’s discuss few important cases here in combination. The number of combination of n different things taken r at a time. Calculate the number of selections of 3 different colored pens from the available 5 pens of all different colors. Here, in this theorem, note that if r = n that is, all the things have to be selected. Calculate the number of ways of combination or selection of 11 players out of 20 players when Virat Kohli, M.S. Dhoni and Y. Singh are always included. Here we have been giving 20 players of which only 11 players are to be selected. We are also given the 3 players out of 20 which must be included in any case. So, actually we can understand that, out of 11 we have already selected 3 players so we just need to select 8 addition players from the remaining 17 players. Let’s take the same kind of example which we have discussed in previous theorem. Calculate the number of ways of combination or selection of 11 players out of 20 players when Ravindra Jadeja and Balaji are always excluded. Again we have been given 20 players of which 11 players to be selected but this time 2 specific players are to be excluded. Thus actually we have the option of 18 players effectively for selecting 11 players. Let’s first understand the meaning of formation of groups. Given the objects and the number of groups to be formed, we need to select the different combination of objects to make the groups. 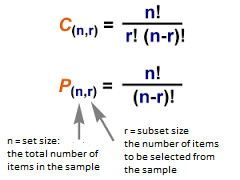 In the above formula, p+qCp  can also be understood as selecting p (for group - 1) or rejecting ‘q’ (for group - 2) out of available (p + q) things. Here we divide by 2! just to avoid the false counting. To understand this false counting. Let’s again take one similar example, where we have four players P1, P2, P3 and P4 for which two groups of equal size is to be formed. We can clearly see that, half of the combinations are repeated. These repeated combinations are called as the false cases. In how many ways 3 teams of 11 players each, 4 teams of 6 players each, 2 teams of 15 players each can be formed out of 87 players. In how many ways six different books can be distributed between four persons, so that each person gets at least one book. Here, we have two special types for the formation of groups or distribution of alike objects. In how many ways, 8 identical coins can be distributed among 4 persons P, Q, R and S.
Here, we have 8 coins and 4 persons, so the required ways = 8+4-1C4-1 = 11C3. In how many ways, 8 mangos can be distributed among 4 persons P, Q, R and S such that all of them receives at least one mango. If you would have studied binomial theorem, then you can easily related the nCr as the coefficient of binomial expansion. And these binomial expansions are also related with the pascal’s triangle. In Pascal’s triangle or the binomial expansion, the value of coefficients increasing initially and reaches its maximum and then starts falling till minimum value at the end. Thus, nCr will be maximum depending upon the value of n as r goes from 0 to n.
Thus, If n even, nCr will be maximum at r = n/2. As discussed in the previous sections, permutation is the combination (or selection) and then arrangement as well. Thus, while calculating the permutation, we first need to choose or selecting the thing before their arrangement. where, nCr denotes the selection and r! denotes the arrangement of r objects for the r places. 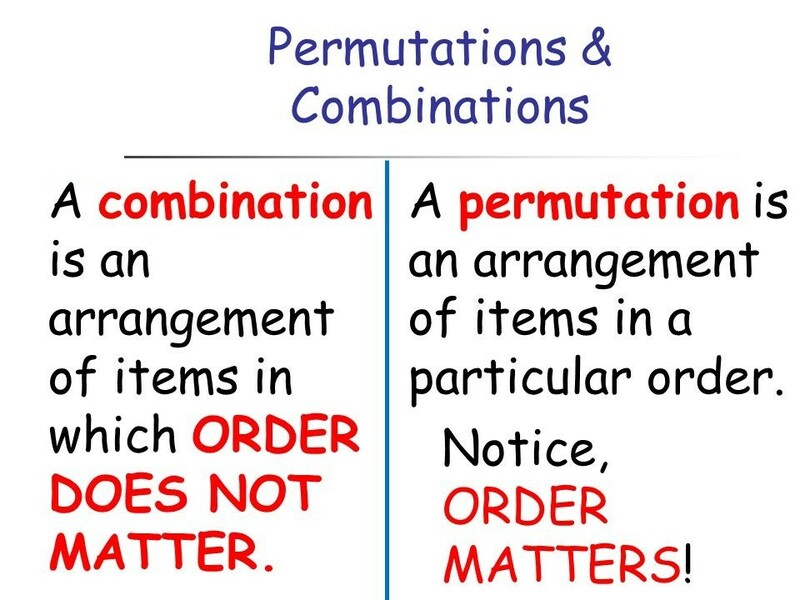 The very basic difference in permutation and combination is the order of the objects considered. In combination, the order is not considered at all while for permutation it is must. So, the permutation is the ordered arrangement while the combination is the unordered selection. From the three alphabets A, B and C, the permutation of these 3 letters will be ABC, ACB, BAC, BCA, CBA and CAB. While the combination of 3 letters will be just (A, B, C). Permutation gives the answer to the number of arrangements while the combination explains the possible number of selections. 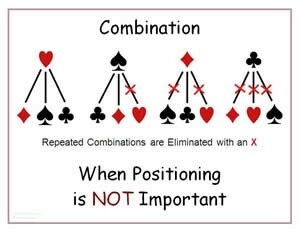 Permutation of a single combination can be multiple but the combination of a single permutation is unique (considering all at a time). In this section, we shall take few important points with respective to the competitive examination. 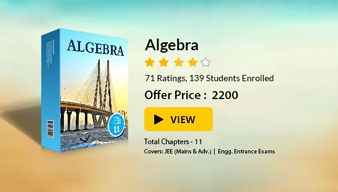 To read more, Buy study materials of Permutations and Combinations comprising study notes, revision notes, video lectures, previous year solved questions etc. Also browse for more study materials on Mathematics here.